Home › Banking › Chase vs Wells Fargo Review: Which is the Best Bank? Chase vs Wells Fargo Review: Which is the Best Bank? Chase and Wells Fargo have over 11,000 branch offices combined, provide checking and savings accounts, certificates of deposit, extensive ATM networks, and intuitive websites coupled with easy-to-use banking apps. So how do you choose between Chase vs Wells Fargo? Regardless of whether checking or savings accounts, fees, # of ATMs, or # of branches are important to you, a clear winner exists in almost every category. Whichever bank you choose, you will find nationwide coverage and around-the-clock customer support. So which bank is best: Chase or Wells Fargo? For years, Wells Fargo had a stellar brand name. It was known to be a conservative bank that assessed risk carefully and navigated the 2008-9 stock market crash better than many of its rivals. It has long been a favorite of Warren Buffett’s Berkshire Hathaway because of its strong balance sheet and conservative lending approach. But Wells Fargo has seen its fair share of turmoil in recent years. For example, it was hit with lawsuits following its admission of dubious practices to goose financial reports. On the other hand, Chase has grown from strength to strength and earns high marks for products like the Chase Sapphire Reserve℠ credit card, which is among the very best credit cards offered by any bank. 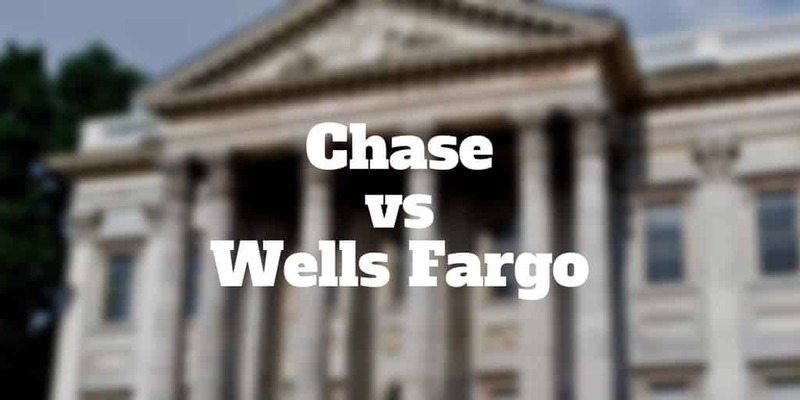 If you look only at recent history, Chase seems like the better choice but when we compare Wells Fargo vs Chase side-by-side, it’s no slam dunk. In fact, Wells Fargo may be a better choice for many customers. Compared to Chase, Wells Fargo has many more nationwide branches. Over 6,000 feature in its network compared to 5,100 at Chase. But unless you are a frequent traveler, other factors are probably more important to you. From checking accounts to certificates of deposit, here are the categories where Wells Fargo comes out on top when compared to Chase. For fee sensitive customers, Wells Fargo has a slight edge over Chase in bank checking accounts. It may only be an extra few bucks a month, but over time that can add up to some decent savings in your pocket versus the bank’s! If savings rates are a priority for you, Wells Fargo has the edge with its certificates of deposit. The APY on 1-year, 3-year, and 5-year CDs are all more favorable than the equivalent rates offered by Chase. You will need to tie up your money longer at Wells Fargo but you are more than compensated for so doing. For example, on a “3-year” Wells Fargo CD, you will actually need to lock up your money for 3 years and 3 months but the reward for so doing is a much higher annual percentage yield (APY) compared to Chase. When it comes to extended overdraft fees, Wells Fargo won’t hit you with any penalty whereas Chase charges $12.50 per transfer. Where Chase shines when compared to Wells Fargo is it provides customers lower fees on overdrafts, lower minimum deposit thresholds on Certificates of Deposit, and sign up bonuses for checking and savings accounts. Chase also has a slightly larger network of ATMs nationwide and a superior banking app. Wells Fargo and Chase are virtually identical when it comes to minimum checking account deposit levels, out-of-network and international ATM fees, savings account interest rates, and customer support access. Although both Chase and Wells Fargo impose checking account fees, it is possible to waive them. At Chase, the best ways to waive fees are to keep your checking account balance above $1,500 or to keep your overall balance above $5,000 in multiple accounts. If you receive $500 or more monthly in direct deposits, that also qualifies you for free checking account privileges. At Wells Fargo, the best ways to waive fees are to keep a daily balance of $1,500 or more, receive monthly direct deposits of $500 or more, or use your debit card monthly at least ten times. College kids may also waive fees by linking to an ATM or debit card. Similarly, you can waive Savings Account fees at both Chase and Wells Fargo. Similarly, Wells Fargo waives savings account fees when daily balances of $300 are held. Chase and Wells Fargo both have nationwide branch offices, extensive ATM networks, and around-the-clock customer support. When it comes to minimum deposits on checking and savings accounts, and out-of-network and international ATM fees, you can’t separate them either. Where they diverge is on the interest you can earn on certificates of deposit where Wells Fargo offers significantly more attractive yield. It also charges lower monthly checking account fees and won’t penalize you with extended overdraft fees. However, checking and savings account fees can easily be waived at both banks by meeting some reasonable daily balance or transfer requirements. Where Chase has the edge over Wells Fargo is in three areas. It has one of the best credit cards on the market for individuals with excellent credit (Chase Sapphire Reserve), lower minimum account balance requirements on CDs, and offers attractive sign-up bonuses for new customers. Plus, Chase won’t hit you with an overdraft protection fee as Wells Fargo does. Have you compared Chase Vs Wells Fargo and found other differences? Tell us more, we would love to hear from you. ‹ Joe Rogan Net Worth: Does He Make $10M Per Year?